PUTNAM COUNTY, NY – New York State Senator Terry Gipson (D-Dutchess, Putnam) joined Andrew Falk, candidate for AD-94, Justin Wagner, candidate for SD-40, Andrea Miller, President, NARAL Pro-Choice New York, Tracey Brooks, CEO, Planned Parenthood Advocates of New York and women’s equality advocates from the Hudson Valley to rally in support of the Women’s Equality Act on Sunday, September 28, 2014. 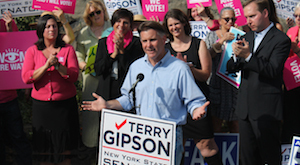 Senator Gipson stated, “In just over a month, the people of the Hudson Valley will have a choice whether they want a State Senator who supports the Women’s Equality Act, or my opponent who wants to take away the rights women have had for over 40 years since Roe Vs. Wade. 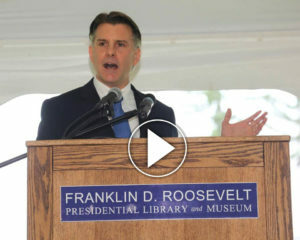 I believe we must protect these rights, and pass the Women’s Equality Act that will also ensure equal pay for equal work and greater protections against domestic violence. 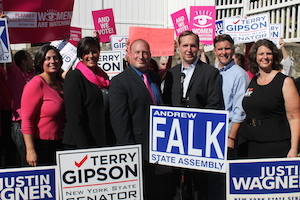 Both leading women’s rights advocates in New York, NARAL Pro-Choice New York and Planned Parenthood Advocates of New York have endorsed Senator Gipson for re-election in the 41st Senate District.